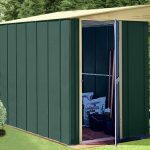 This dark green and cream coloured metal shed proves that you can have a large storage facility in your garden, without having to pay a large price for it. Even though the headroom could have been much more generous, so be careful when going through the double sliding doors, there is still a huge amount of space in which you can store lawn mowers, gardening tools and equipment and barbecues. If you plan on storing anything of value inside, for example we can easily imagine it being used as an all weather motorbike store, then you’ll need to invest in a good quality padlock and alarm. The window free design, however, automatically makes this a more secure environment by stopping unauthorised eyes from seeing what’s kept inside. Whatever is stored within will be amply protected from the elements. The apex roof itself offers the first line of defence by carrying rain away, but this is also helped by the high quality galvanised steel used for the cladding. 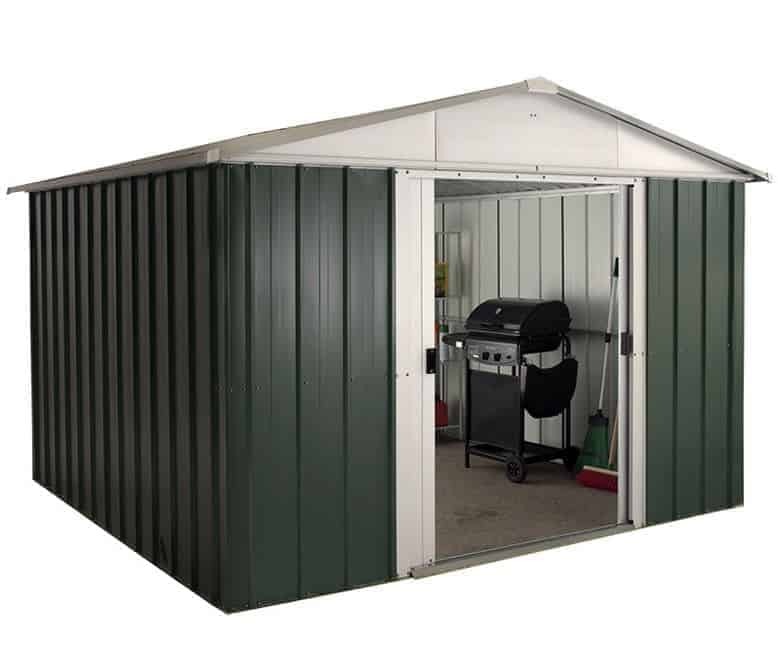 It’s for these reasons that this shed has a 12 year warranty against rust damage, which is a reassuring indication of the high quality of components used in the building as a whole. We were very impressed by the sheer scale of this metal storage shed, especially as it comes at a price point well below three hundred pounds. It means that it will be suitable for even larger gardens, and thanks to its dark green colour scheme, with a contrasting creamy grey colour for the doors, gable and roof, it makes an attractive addition to any landscape. We found the paint itself to be well applied, both externally and internally, and this acts as an extra layer of protection against rain and the sun. We always like to see apex roofs on sheds of this size, as otherwise there’s a risk of rain pooling on the surface. At it’s peak the roof height is 2.02m, and it has an eaves height of 1.63m which is relatively low for a shed on a scale such as this. The overall width of the shed is 3.03m and the overall depth is 2.37m. These measurements include the overhang, and also the represent the minimum area that you’ll need to set aside for the base. When we review metal sheds of this size, we sometimes find that they can feel a little flimsy in windy weather. That wasn’t the case here, which is testimony to the high quality of the cladding and frame. In itself, it isn’t the heaviest cladding we’ve seen, but it is strengthened considerably by the added resilience that comes from hot dipped galvanisation. As usual with metal sheds, no floor is supplied as it’s designed to be fitted directly onto concrete. We were pleased to see that a suitable anchor kit was included, as this isn’t always the case. For the base, you’ll need a completely flat area of concrete, which we recommend checking with a spirit level, or alternatively a suitably sized patio or paving area. 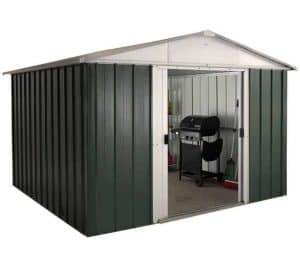 When purchasing a large metal shed, one common worry is the appearance of rust, as this can run a previously harmonious look as well as weakening the structural integrity. That’s why we find it reassuring that Yardmaster have provided a 12 year warranty against rust perforations. With galvanised steel used for all the surfaces, including the apex roof, we feel that this could have been even longer, but it’s still two years longer than the warranties offered on some metal sheds we review. There is, of course, no need for further treatments to be applied by the owner. The width of the double sliding doors was impressive, at 1.20m, meaning that wider objects such as bicycles, workbenches, or ride on lawnmowers can easily be stored and retrieved. We were impressed by the smooth sliding mechanism, and also like the fact that it’s fitted internally giving it extra protection. We were less impressed by the door height, a lowly 1.58m, although this was necessarily low because of the eaves height. This a window free shed, so because of its size you’ll want to have access to an artificial light source to illuminate the corners. Whilst the lack of windows means that you couldn’t use the shed as a workshop, it also means that the contents are kept private and therefore secure, and we welcome this as a design feature. 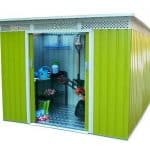 Because the shed is so accommodating it can be used to store a lot of tools and equipments, and could therefore potentially be seen as a target for opportune thieves. For this reason, a padlock is a must buy and it might be worth considering a shed alarm too. The handles are holed and ready to receive a padlock. We highly recommend that security features, as mentioned above, are purchased at the same time as the shed, although these aren’t available with the shed so will have to be sourced elsewhere. One item that is available to purchase as an optional extra, and which we think will be a very valuable addition, is a shelving unit. 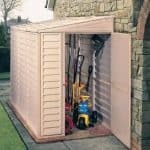 Racking can make a shed of this size even more versatile, not to mention making it easier to organise and keep tidy. The unit features four resin shelves and is portable and stand alone, so you can position it wherever is best for you. With such a large shed, we are always concerned that corners may have been cut to keep the price down, but we’re pleased to say that wasn’t the case on this occasion. The rust free screws are an example of the overall attention to detail. We feel the cladding could have been a little thicker, even though the shed felt stable once assembled. This should still, however, provide long lasting protection against the weather. The generous depth and width give a very large base area in which to store items, but the low roof height means that taller items may have to be stored horizontally. There are a lot of screws in this kit, as we expected in a large shed, but as the instructions were sometimes not the clearest it took us longer than we expected, around six hours, to construct it. You’ll need at least two people, and may need to set aside two days for the job. 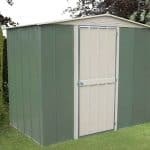 For a shed of this size, with quality evident throughout and all fixtures and fittings included, this represents very good value for money. 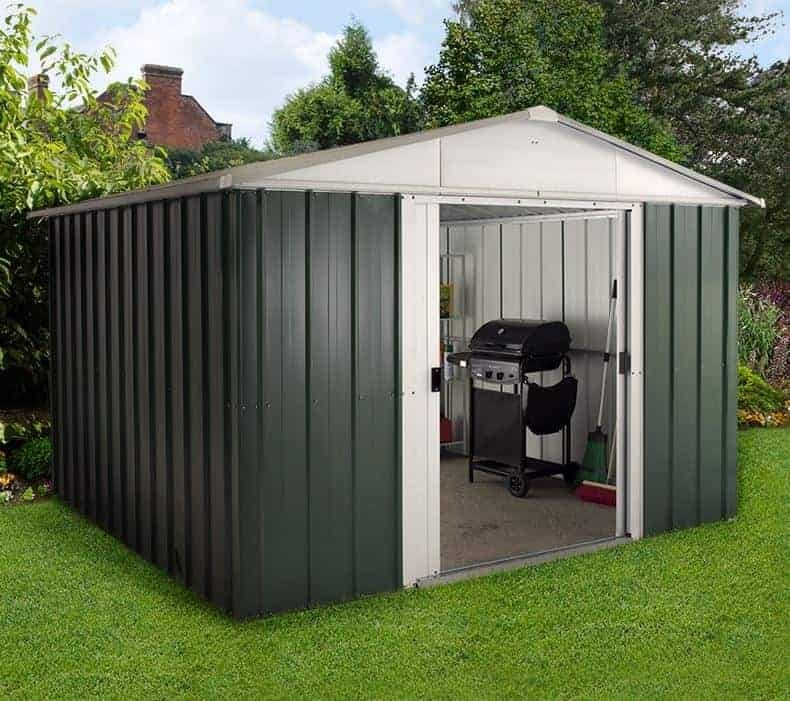 Final Thoughts: Large gardens need large storage solutions, and this shed, the largest in this Yardmaster range, can be the perfect solution if you’re working to a tight budget. It’s a pity that the height wasn’t greater, as otherwise it could easily have been suitable for use as a workshop. 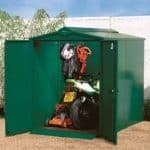 As it is, you won’t want to spend too much time inside, but it’s still highly suitable for the storage of all your garden tools and equipment. We would of course recommend adding a padlock, but once this has been done the lack of windows and internally fitted doors both make it difficult for anyone other than the owner to gain access. In the market for a shed this one ticked all the boxes,your description was very informative and comprehensive. on that basis I was one step away from purchasing. Unfortunately when I used your link for a “special offer” price of £290 I found this offer did not exist,very disappointing. spoke to the “live chat” on the shedstore website and they confirmed this. As I said very disappointed. Hi Andy, we are working with ShedStore to make all the prices on WhatShed update daily so things like this don’t happen again.